As a tofu lover, Mapo Tofu is a huge favourite of mine. 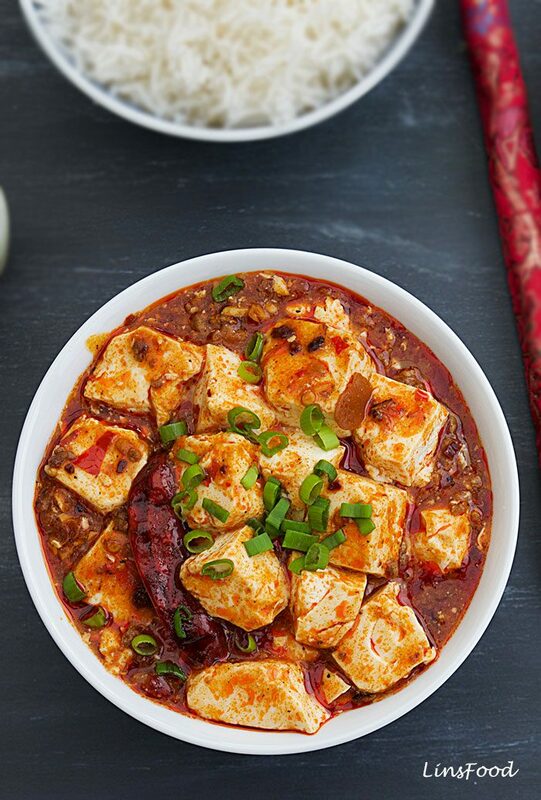 This Sichuan classic is a dish of melt-in-the-mouth silken tofu, covered in a fiery red, earthy, slightly tongue numbing chilli sauce, made with Doubanjiang, the Sichuan chilli bean paste. 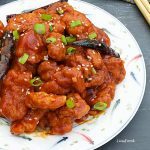 Plain white rice is a must – nothing else is going to allow you to savour the multi layered flavours in this most delicious of Sichuan recipes! As mentioned above, I adore tofu in all its incarnations, I love ’em steamed, grilled, fried, boiled, puffed, stuffed and even fermented. So I simply cannot understand how anyone can not like tofu! If you really, really, don’t like tofu, scroll on down to see how you can still enjoy an approximation of this dish, because I’m tellin’ ya – this is one flavour packed recipe! There is no getting away from the fact that it is spicy. 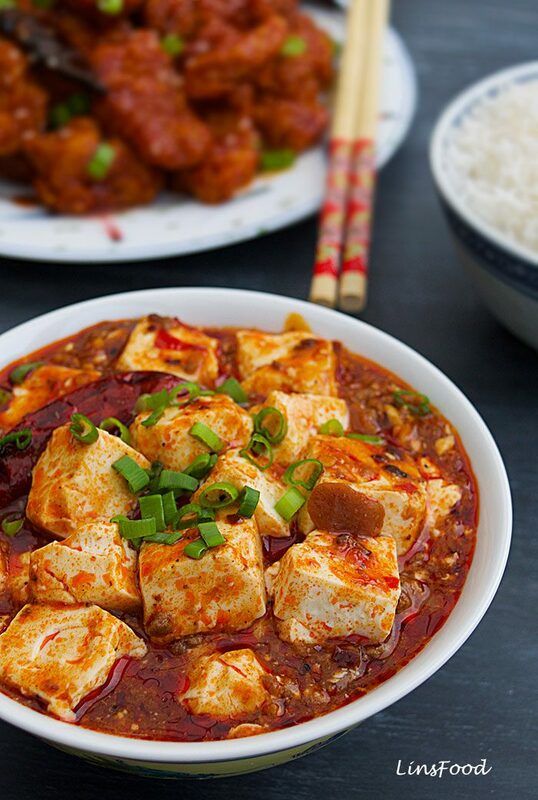 Mapo Tofu is the personification of the Sichuan description, Ma-La, which means numb-hot. Sichuan food is known for its spiciness. And to accompany the intense heat, you have sichuan peppercorns with their numbing ability. Just when you think your mouth is about to burst with all that fiery chilli, the sichuan peppercorns (see below) do their thing and numb your mouth, your tongue and your lips! 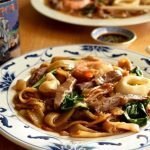 Allowing you to continue enjoying the delights that is Sichuan food! Is that just so cool, or what? If you like your spicy food, that is. The tofu used in making mapo tofu is of the silken variety. You want to look for a packet that says medium-firm silken tofu, if you can. If buying from a Chinese shop, get the shopkeeper to help you out. Silken tofu is very soft and breaks up at the slightest excuse, and while that is one of the beauties of this dish, you don’t want it so soft that you end up with tofu mince. But if it’s your first time, and you do break all the tofu up, don’t worry about it, almost all my students do that the first time, as they are so used to vigorous stir frying, when it comes to Chinese food! If you aren’t so sure about the tofu, by all means start with a firmer tofu, and work your way down the scale. Cooking is about fun and experimenting too. Traditionally, either minced beef or pork was used in this recipe. Growing up in Singapore, I often ate the one made with beef which was really heavy on the meat and light on the tofu. Now that I’m older and wiser, I think, that heavy on the meat isn’t the point of the recipe! You can use any minced meat you like, even turkey. And turn it into a vegetarian mapo dofu, if you like, see below. 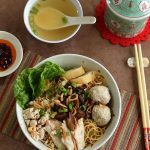 To the folks from Sichuan (Sichuanese? ), doubanjiang, or douban, is the soul of Chinese food. To me, mapo tofu exhibits all the complexity and magic of doubanjiang to perfection: hot, salty, earthy. Think umami, umami, umami! Click here to read more about Doubanjiang, the chilli bean paste made with broad beans, not soy beans. Their claim to fame is their mouth numbing characteristic; you get a tingling sensation on your tongue which sets the stage for the typically spicy dishes found in Sichuan cuisine. Click here to read more. 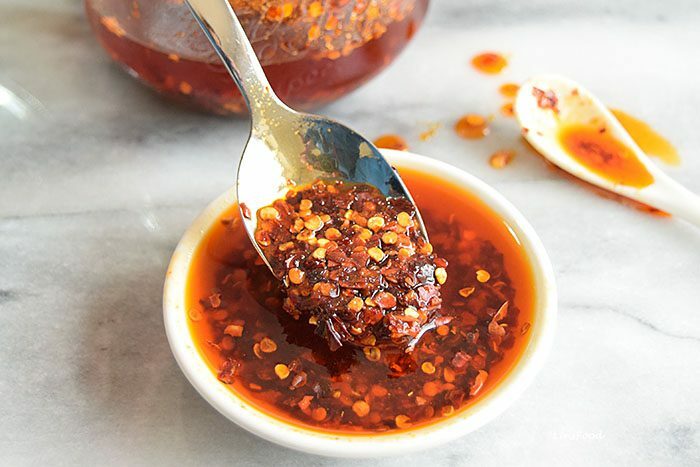 All spicy Sichuan dishes need some sort of chilli oil, it’s one of the pillars of Sichuan cooking. You can use a shop bought one, if you like, or make up a “proper” Sichuan chilli oil and keep it in your fridge, like I do. 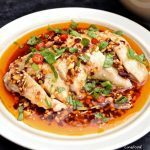 In fact, I have a couple of recipes for it, click here for my favourite recipe for Sichuan chilli oil. I will also give you a super quick version here, just vegetable oil spiced up with peppers. You decide which you’d like to go for. This dish can be made completely vegetarian with the use of quorn mince to replace the meat, or, better still, shiitake mushrooms. Just slice your shiitake into strips, and follow the recipe. For All You Tofu Haters! Keep the meat, and use whatever vegetables you happen to fancy. I think green beans and carrots will go splendidly in this. Mapo Tofu (or Mapo Dofu) recipe. 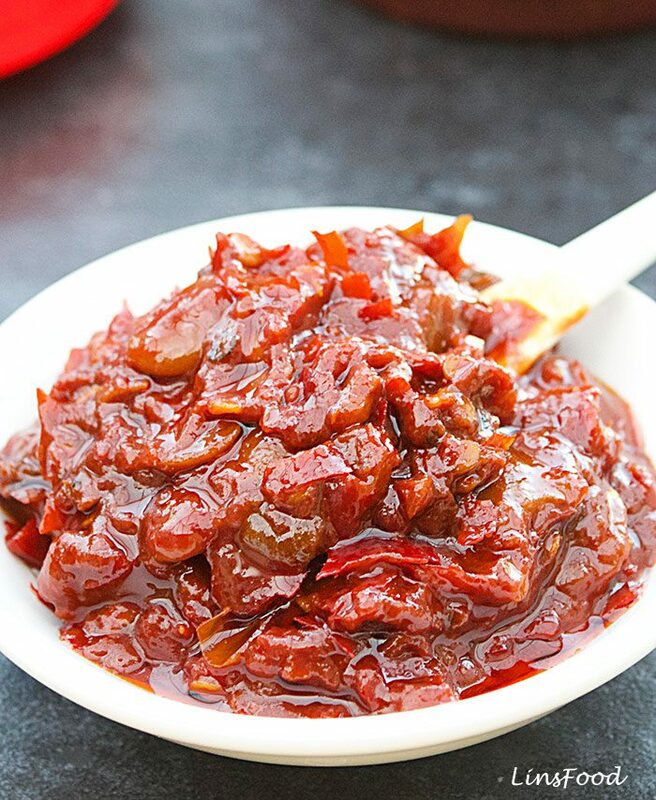 This Sichuan classic is a dish of melt in the mouth silken tofu, covered in a fiery red, earthy, slightly tongue numbing chilli sauce, made with Doubanjiang, the Sichuan chilli bean paste. Heat the oil in a wok or frying pan over medium high heat and fry the dried chillies for one minute. Transfer the oil and chillies into a heatproof bowl and add the chilli flakes and sichuan peppercorns. Leave to infuse while you get everything else ready. Add all the marinade ingredients in a large bowl, and using your hands, work the marinade into the meat. Leave aside while you get the other ingredients ready. No need to cover, we won't be long. Cut up the tofu into cubes measuring about 2.5cm/1". Lightly crush the sichuan peppercorns with a pestle and mortar. Get your garlic, ginger and spring onions (scallions) ready, as the description above. Finely chop your garlic and ginger. Split the spring onions into white and green, and slice thinly. Heat the 2 Tbsp of vegetable oil in a wok or large, deep frying pan on medium heat and fry the sichuan peppercorns for 30 seconds. Add the garlic, ginger and white sliced spring onions (scallions) and fry for another 30 seconds. Increase the heat to high and add the minced meat you are using. Break the meat up with the end of your spatula and cook for 3-5 minutes until your meat is browned all over. Add the doubanjiang and the wine and stir to mix well, cook for 1 minute. Add the water, stir and bring back to simmering point. Now stir the cornflour paste in and cook for 20-30 seconds until the sauce has thickened. Add the tofu cubes, and VERY carefully stir the tofu and the sauce, being careful to break up as little as the tofu as possible. But don't fret too much, if it's your first time. Let the tofu cook for 3 minutes. While the tofu is cooking, strain the chilli oil you made earlier into a clean cup or bowl. Drizzle some of the chilli oil all over, however much or however little you like. I usually use 2 Tbsp of it and keep the other 2 Tbsp, covered, in the fridge for something the next day. Take off heat, scatter the green spring onions (scallions) all over and serve immediately. Nutrition is based on 6 servings. I have been trying a long time to try to cook this. But that doubanjiang is my obstacle.. I don’t want to buy it just to make one recipe, Do you have a substitute? 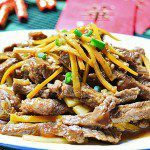 or another recipe that use doubanjiang? I often use gochujang (hot pepper paste) it’s Korean ingredients. Can it be used as a substitute? Wow, this is a super looking dish. Must try it, I love tofu. Thank you Johann, let me know if you do. Wow, this looks really interesting. I am just exploring authentic Chinese food, and this looks really amazing. I’ve already looked for that chili paste and ordered it. So, hopefully, will be making it next weekend for the family. Thanks. Thanks James. That was quick, ordering the paste – don’t you just love online shopping? Let me know what you guys think of it! This looks amazing. I’ve never heard of it but am looking forward to trying it out. My boyfriend is vegetarian, so I will definitely be making the one with shiitake mushrooms as well as one with meat for me. What is your favourite meat to use for this? Hi Evelyn, I love it best with minced beef. I think it adds even more depth to the dish. Having said that, I love it fully vegetarian too, with shiitake, which have their own umami kick. Thank you, thank you! This is a favourite recipe of mine, but I’ve never made it. My new year resolution is to cook more, so I’ve printed this and stuck it on the fridge for this Sunday! A pleasure, thank you Mary. Let me know how it goes!